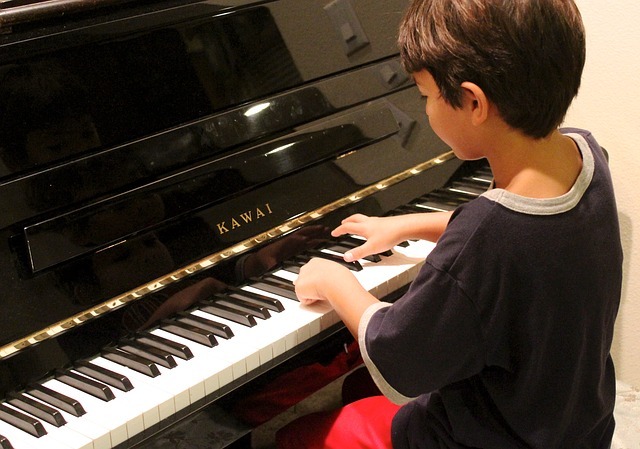 Boy playing piano is in the public domain. “Critical thinking skills refers to abilities to analyze, evaluate, infer, interpret, explain, and self-regulate (Facione, 1990; vanGelder, 2005). A simple way to define critical thinking is the ability to make good decisions and to clearly explain the foundation of those decisions” (Egbert, 2009). Critical thinking is often referred to as critical listening in the music class. Students are asked to listen critically to their own music playing and determine what sounds good and what needs to be improved. They compare the sound they are producing with what the music is supposed to sound like. During independent practice, students can use a variety of tools to assist them in developing critical listening skills. Students can use practice assessment software to perform music on the screen and receive instant feedback about which notes were played correctly or incorrectly. Students can record themselves during individual and group practice sessions for further analysis and evaluation. These recordings can be shared online for feedback from others. Students can critique performances using a spreadsheet, assigning scores based on several criteria. Weak areas can be identified and improvements can be tracked over time. Festival Rating is a sample spreadsheet to track class progress that can be adapted for individual and small ensemble use as well. Students can improve intonation by using a tuner app to track the notes of a chromatic scale to identify pitch tendencies on their instrument. When used in conjunction with a spreadsheet, intonation issues can be easily identified. Students can use a metronome to ensure a steady tempo when practicing. When used in conjunction with a spreadsheet, gradual increases in tempo over time can be tracked to increase tempo when building speed. An Intonation Chart is one way for students to track pitch tendencies on an instrument (described in Tuning for Intermediate Students). This sample tuning spreadsheet for trumpet shows how to how a student can track these tendencies and see them visually. PracticePlus – This all-in-one metronome and tuner also includes the ability to record for no cost. Recordings can’t be edited, but can be shared via email or social media; however, it is available on iOS but not Android. Metronome Plus – Like PracticePlus, this app includes a metronome and tuner along with a recording feature. Recordings can’t be edited but can be emailed (not shared on social media). It is available on iOS but not Android. Improving listening skills can further improve the critical listening process by learning to identify rhythms, intervals, and chords by ear.